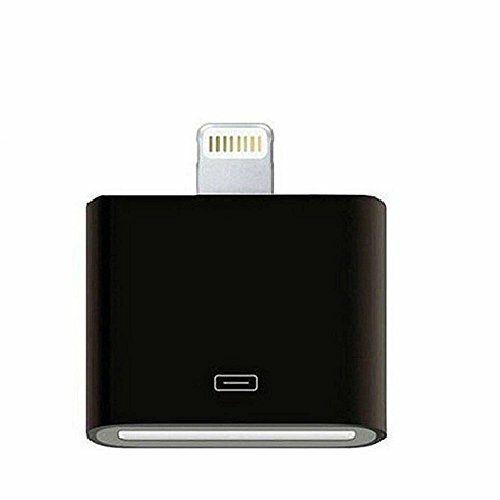 Lightning 30-pin to 8-pin adapter with cable for Apple iPhone 5 / 5S/ 5C, iPhone 6 / 6S, iPhone 6 Plus / 6S Plus, iPhone 7, iPhone 7 Plus, iPod and iPad With this adapter, you don't have to buy a Lightning cable and you can charge your Apple Lightning device and synchronise data with your old 30-pin USB cable. 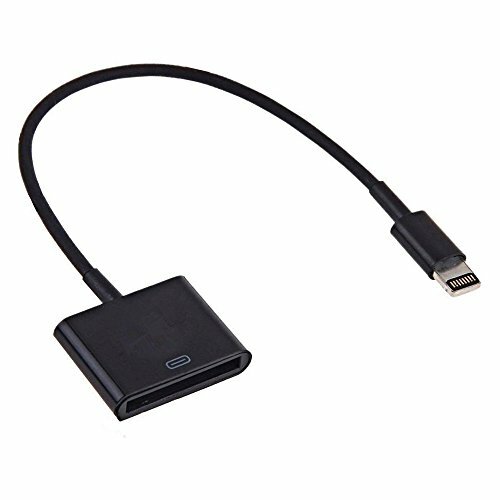 It is compatible with all versions of the iPhone, iPod and iPad with the 8-pin Lightning connector and is compatible with latest iOS, without any error message. Practical and always handy: thanks to its compact size and light weight, this adapter is ideal for carrying and travel. Product features Synchronise data with your iPhone, iPod or iPad. Fast and efficient charging. 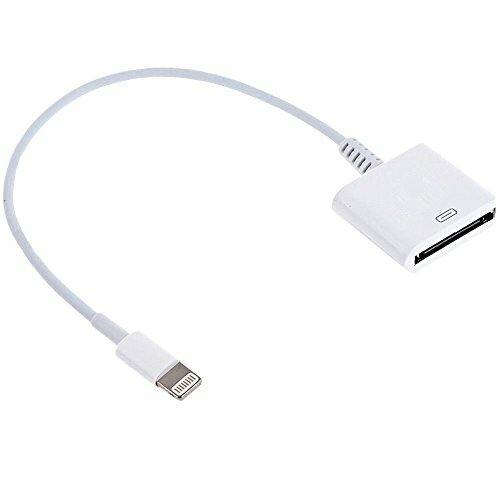 Suitable for Apple products with 8-pin Lightning connector. Also works with the latest iOS update. High-quality manufacturing, strong, durable material. Please note: no audio and/or video transmission. Cable length: approx. 15 cm. Compatibility iPhone 5. iPhone 5S. iPhone 5C. iPhone 6. iPhone 6S. iPhone 6 Plus. iPhone 6S Plus. iPhone 7. iPhone 7 Plus. iPod Nano 7. iPod 5G. iPad mini. iPad mini 2. iPad mini 3. iPad mini 4. iPad 4. iPad Air. iPad Air 2. iPad Pro. 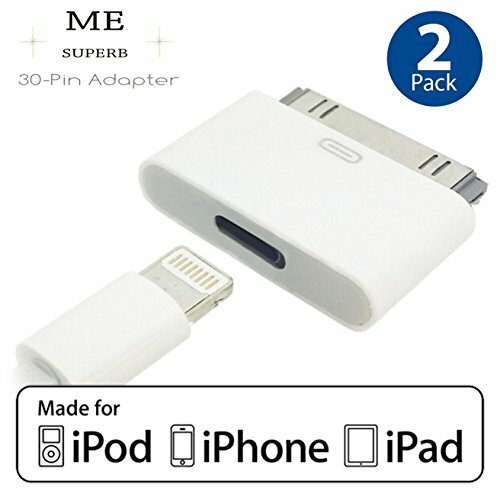 8-Pin Lightning Male to 30-Pin Female Charger Adapter Converter for 8-Pin Lightning devices ---- This adapter lets you connect devices with a Lightning connector to many of your 30-pin accessories. Supports analog audio output and USB audio, as well as syncing and charging. Video output not supported. 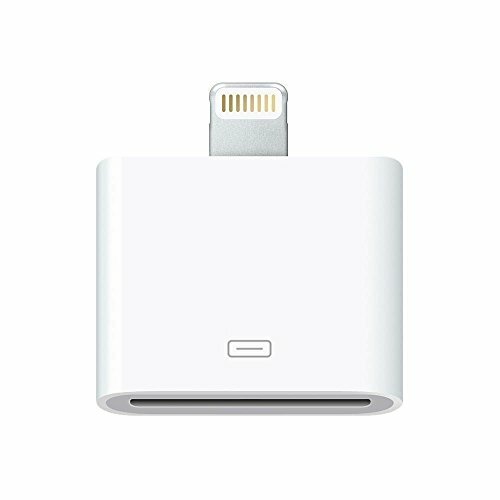 Lightning 30-pin to 8-pin adapter with cable for Apple iPhone 5 / 5S/ 5C, iPhone 6 / 6S, iPhone 6 Plus / 6S Plus, iPhone 7, iPhone 7 Plus, iPod and iPad With this adapter, you don't have to buy a Lightning cable and you can charge your Apple Lightning device and synchronise data with your old 30-pin USB cable. 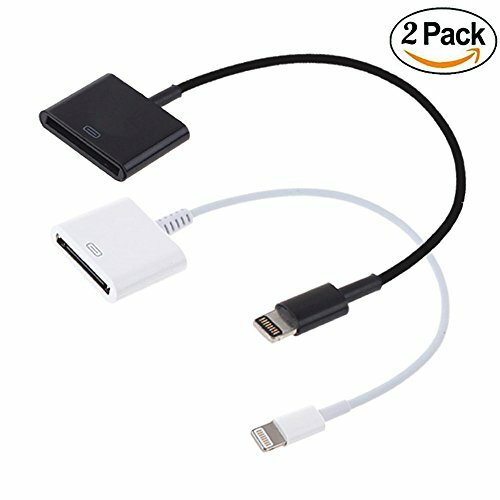 It is compatible with all versions of the iPhone, iPod and iPad with the 8-pin Lightning connector and is compatible with latest iOS, without any error message. Practical and always handy: thanks to its compact size and light weight, this adapter is ideal for carrying and travel. Product features Synchronise data with your iPhone, iPod or iPad. Fast and efficient charging. 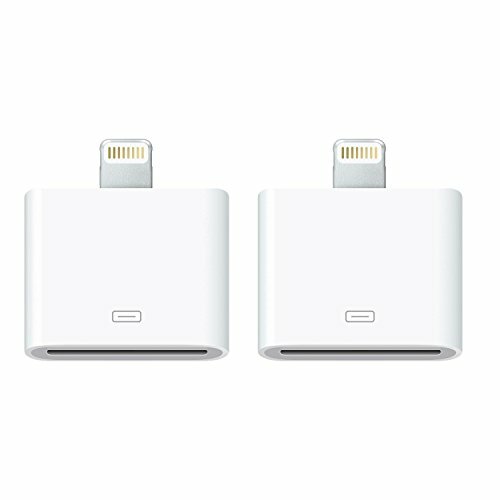 Suitable for Apple products with 8-pin Lightning connector. Also works with the latest iOS update. High-quality manufacturing, strong, durable material. Please note: no audio and/or video transmission. Cable length: approx. 15 cm. Compatibility iPhone 5. iPhone 5S. iPhone 5C. iPhone 6. iPhone 6S. iPhone 6 Plus. iPhone 6S Plus. iPhone 7. iPhone 7 Plus. iPod Nano 7. iPod 5G. iPad mini. iPad mini 2. iPad mini 3. iPad mini 4. iPad 4. iPad Air. iPad Air 2. iPad Pro. Box contents: 2 Pack 30-pin to 8-pin Lightning adapter with cable. AKwor Lightning to 30-Pin Adapter with Video and Audio(0.2M) Great Charging&Syncing Performance: 8 pin Lightning Cable with anti-resistant aluminum alloy connectors, 100% compatibility to transmit data stably and charge fast without error messages. High Quality: Our quality cables are constructed with durable braided material and heat-resistant aluminum connectors, which enhanced a long lifespan of every cord. 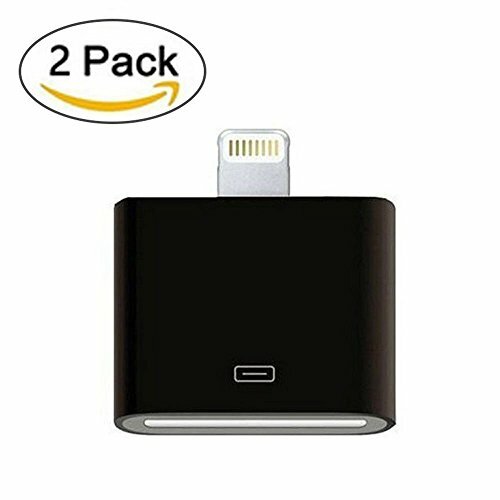 Applicable and Compatible: Applicability with charging cable ensures complete and fast charge and compatibility with: iPhone X, iPhone 10. iPhone 8, iPhone 8 Plus. iPhone 7, iPhone 7 Plus. iPhone 6, iPhone 6 Plus, iPhone 6s, iPhone 6s Plus. iPhone 5, 5c, 5s. iPad Air, iPad with retina display. iPad mini, iPod Touch 5th gen, and iPod nano 7th gen. Warranty and Service: We guarantee the durability of this product by offering 12-month warranty, free replacement or a full refund. 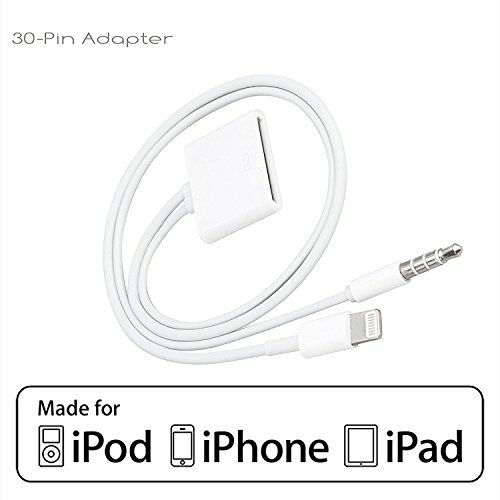 Compare prices on 30 Pin To 8 Pin Adapter Ipod Nano at ShoppinGent.com – use promo codes and coupons for best offers and deals. Start smart buying with ShoppinGent.com right now and choose your golden price on every purchase.